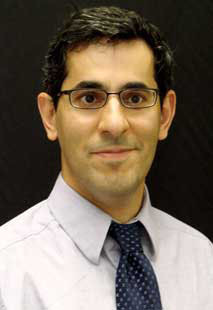 Ardalan Vahidi joined the Department in 2005 after the completion of his Ph.D. at University of Michigan, Ann Arbor. He received the B.S. and M.S. degrees in Civil Engineering from Sharif University in 1996 and 1998 respectively and the M.S. degree in Transportation Safety from the George Washington University in 2001. Nianfeng Wan and Ardalan Vahidi, and Andre Luckow, “Optimal Speed Advisory For Connected Vehicles in Arterial Roads and The Impact on Mixed Traffic,” to Appear, Transportation Research: Part C, 2016. Nianfeng Wan, Ardalan Vahidi, and Andre Luckow, “Reconstructing Maximum Likelihood Trajectory of Probe Vehicles Between Sparse Updates,” to Appear, Transportation Research: Part C, 2016. Yasha Parvini, Jason Siegel, Anna Stefanopoulou, and Ardalan Vahidi, “Identification and Validation of an Electro-Thermal Model of Cylindrical Double Layer Supercapacitors for Low and High Power and Temperature Operations,” Accepted and Available Online, IEEE Transactions on Industrial Electronics, 2015. Alireza Fayazi, Ardalan Vahidi, Grant Mahler, and Andreas Winckler, “Traffic Signal Phase and Timing Estimation from Low-Frequency Vehicular Probe Data,” IEEE Transactions on Intelligent Transportation Systems, 16, 19-28, 2015. Grant Mahler and Ardalan Vahidi, “Red Light Avoidance through Probabilistic Traffic Signal Timing Prediction,” accepted and available online, IEEE Transactions on Intelligent Transportation Systems, 15, 2516-2523, 2014. Hosseinali Borhan, Ardalan Vahidi, Tony Phillips, Ming Kuang, Ilya Kolmanovsky, and Stefano Di Cairano, “MPC-based Energy Management of a Power-Split Hybrid Electric Vehicle,” IEEE Transactions on Control Systems Technology, 20, 593-603, 2012. Chen Zhang and Ardalan Vahidi, “Trip Preview in Energy Management of Plug-in Hybrid Vehicles,” IEEE Transactions on Control Systems Technology, 20, 546-553, 2012. Dean Rotenberg, Ardalan Vahidi, and Ilya Kolmanovsky, “Ultracapacitor Assisted Powertrains: Modeling, Control, Sizing, and The Impact on Fuel Economy,” IEEE Transactions on Control Systems Technology, 19, 576-589, 2011. Behrang Asadi and Ardalan Vahidi, “Predictive Cruise Control for Improving Fuel Economy and Reducing Trip Time,” IEEE Transactions on Control Systems Technology, 19, 707-714, 2011. Wesley Greenwell and Ardalan Vahidi, “Predictive Control of Voltage and Current in a Fuel Cell-Ultracapacitor Hybrid,” IEEE Transactions on Industrial Electronics, 57, 1954-1963, 2010. Wolfgang Schmittinger and Ardalan Vahidi, “A Review of the Main Parameters Influencing Long-Term Performance and Durability of PEM Fuel Cells,” Journal of Power Sources, 180, 1-14, 2008. Ardalan Vahidi, Anna Stefanopoulou, and Huei Peng, “Current Management in a Hybrid Fuel Cell Power System: A Model Predictive Control approach,” IEEE Trans. on Control Systems Technology, 14, 1047-1057, 2006.